So many rivers, and so little time. It's a nice problem to have. And believe me, here in Western Montana, we have it in spades. Missoula is one of the few places on earth where you can fish four major trout rivers in four days without chartering a float plane or coming down with a bad case of road fever. Near Missoula the Bitterroot, Blackfoot and Clark Fork Rivers, along with Rock creek, come together to form a spectacular variety of trout water. In fact there are more than 263 miles of riffles, pools, runs, foam lines and eddies within an hour's drive of downtown Missoula. From the calm, flat spring creek like stretches of the Lower Bitterroot and Clark Fork Rivers to the fast moving freestone pocket water of the Blackfoot and Rock Creek, an angler can challenge him or herself to whatever degree desired. But quantity, variety and quality of water aren't all that make Western Montana unique. Just as important is the long season. The fishing heats up early in March and continues (with a short pause for runoff) right through October, with some of the finest fishing during the least crowded time, early in the spring and late in fall. Because of our lower elevation, as compared to the rest of the state, our waters warm quicker in the spring and produce the first and some say the best dry fly fishing of the season. The mild falls also drag out our season into late October as fish are feeding hungrily before winter sets in. Best of all, there's a seemingly endless buffet of insects large and small -- Skwala stones in March; Gray Drakes in April; Salmonflies in June; PMD's in July; Hoppers in August; Baetis in September; October Caddis in, of course, October, and that's just a sampling. There are particular hatches that occur here in Western Montana which are relatively unique to the area. 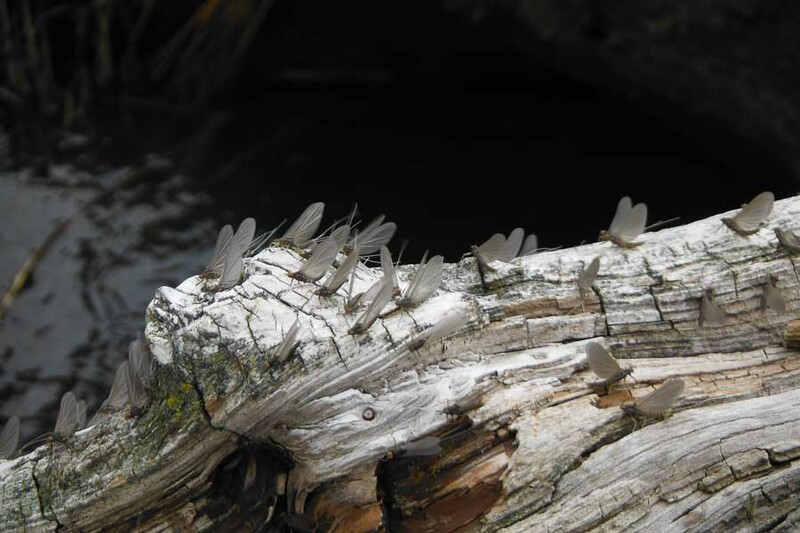 Our proliferation of early stoneflies from March through July is produced because of the oxygen-rich, clean water that flows in all our rivers. These large insects produce a great amount of protein in every bite that allow our wild trout to grow to their large sizes quickly. In March, the Skwala stonefly gets most of the attention, but there is also the Nemoura and Capnia stones that hatch at the same time. 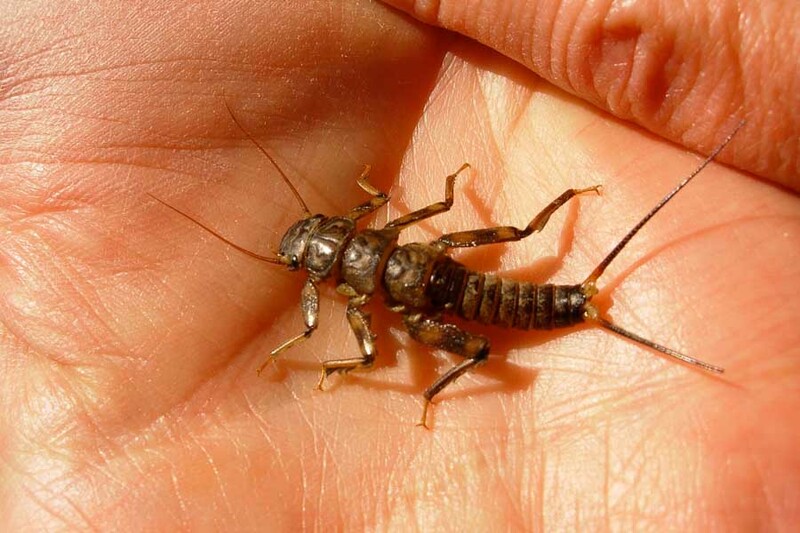 Unlike other stoneflies, these insect do not flutter their wings as much and must be imitated with low riding patterns such as bullet heads and parachute stimulators. Right afterwards, we also have a proliferation of Amoletus gray drakes right up until runoff in early May. Again lower riding mayfly patterns such as Quigley's Cripple and parachute extended body drakes work best in these cooler months. After runoff, we are blessed with the Salmonfly, Golden Stone and Little Yellow Sally hatches with a few Green Drakes thrown in for good measure. As the rivers drop and summer settles in, we have a proliferation of Pale Morning Dun Mayflies, evening Caddis and Trico hatches. As the fields next to the river dry, the hoppers are drawn to the green grass along the banks. Trout being the opportunists that they are, will grab an unsuspecting hopper floating by. The best imitations we use are the Parachute Hoppers and Dave's Hoppers fished close to the bank. (Many times trailed by a Trico spinner.) Summer can also be a great time for the Spruce Moth which is a terrestrial moth that hatches out of the pine trees lining the banks of Rock Creek and the Blackfoot in particular. Cooler weather after Labor Day brings on mayflies by the millions, particularly Baetis and Mahogany. The spinner stage of these mayflies is particularly tempting to trout. Also the size 8-10 October Caddis shows up and gives the trout one more feast before they hunker down with midges for the winter. All in all, you can see that there is a veritable smorgasbord of insects for trout to gorge on throughout the year. So no matter when you are here in Western Montana, there will always be a hungry trout somewhere waiting for you. As I said before, so many rivers, and so little time.